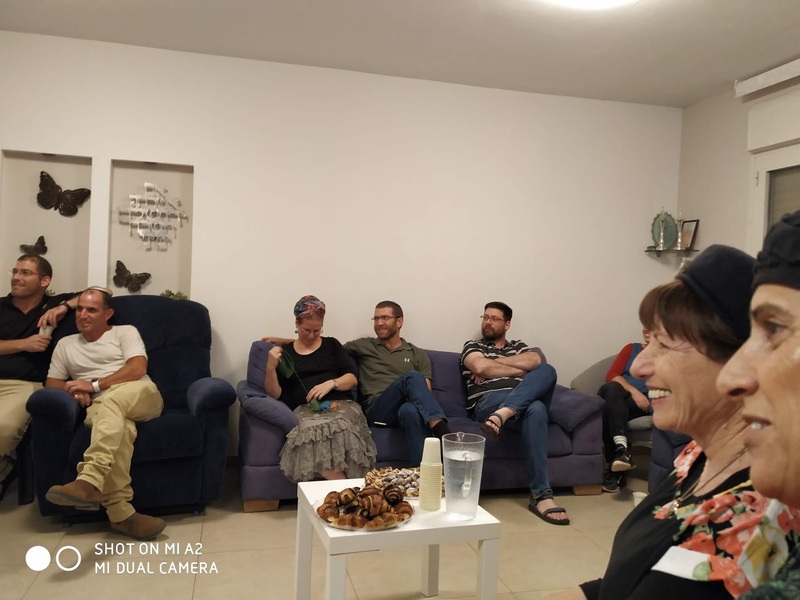 Shiloh Musings: Who Should Replace Avi Roeh as Head of Binyamin Regional Council? Who Should Replace Avi Roeh as Head of Binyamin Regional Council? There will be local elections all over Israel next week. That includes the Regional Council of Binyamin (Benjamin,) the local council of Gush Shiloh Bloc and our representative to the Binyamin Forum (parliament.) Yesterday I wrote that I'm supporting עמק שילה- ועד מקומי Emek Shiloh-Vaad Mikomi, vote עמ list for our local council, and today I'll write about the top position. 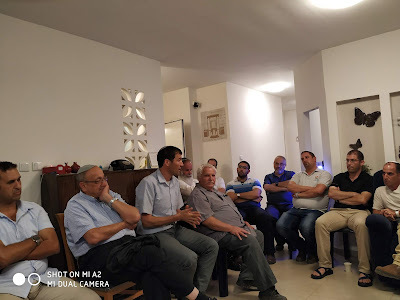 Last night I attended a chug bayit, parlour meeting to meet, listen to and ask questions of Shiloh Adler, one of the two candidates hoping to replace Avi Roeh as head of the Binyamin Regional Council. The meeting was very well attended, which doesn't show up well in the photos because of where I sat. Men and lots of women were there, too. Most were of the younger generation with children in school and still having babies. There were a few around my age. I was the oldest, but not the most veteran in Shiloh. By process of elimination, I had quickly decided that I'd vote for Shiloh Adler even before hearing anything about him, but I needed to make sure I wasn't making a big mistake. The reason why I didn't want to vote for Yisrael Ganz is simply because I'm disgusted at how things are being done by the Binyamin Regional Council, and Ganz is one of the present hierarchy there. Our public transportation is awful. Buses are unreliable, schedule problematic, routes, not enough or varied etc. A couple of years ago, the Binyamin Regional Council replaced very good wooden bus stops (shelters) that had windows and replaced them with badly designed and constructed metal ones that neither protect us from the elements nor allow us to see an approaching bus nor let the driver see that we're waiting inside. And then right before elections, there was extra money, so they decided (like many other municipalities) to give us new sidewalks which almost cancelled our bus service. That's because the so-called planners never bothered to check government regulations for road width. They also destroyed very safe and sturdy safety rails on the staired paths and replaced them with cheap, thin rickety ones, which not only are already falling apart, but they are falling out of their sockets. While working on these "upgrades," as the Mateh Binyamin, the regional council calls them, they broke my main water pipe and damaged the garden wall. And there are other problems. So, for me, it was an easy and obvious choice not to vote for anyone connected to the present administration. There was a nice group at the meeting, mostly young people from the middle and down the hill. Adler came well prepared, with a staff/crew of impressive people, who also spoke. What bothers him is that nobody ever says they're from Binyamin. After all these years, and despite the large size and population, it never has made people feel its presence. That bothers him, and he'd like to fix it. He asked for questions. I had to reduce what I had planned to the minimum, so I mentioned public transportation and the awful roads. I stressed that we can't get to most of the Binyamin yishuvim easily, even Kochav Hashachar which is close as the crow flies. And Places like Talmon are near impossible. I also complained that the moetza put all the offices in Psagot, which is out of the way and now in Sha'ar Binyamin. 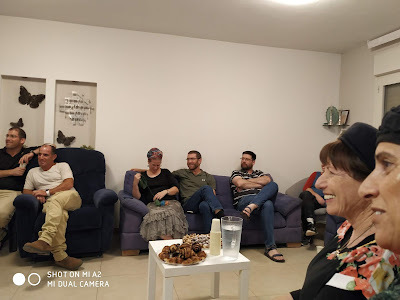 I mentioned that I consider Shiloh as having moved to Petach Tikvah and in my combination bus/tremp, I can get to Tzomet Yarkon more quickly than Jerusalem. Adler seems to understand a lot about the financial potential, business etc. Later he replied to my question. He has researched (his staff no doubt) the public transportation in other areas and agrees that ours is the worst. I came up with someone who says that Ganz says many of the same things, but Ganz didn't come with a strong backup team. And although he has been with the moetza for a number of years, he never really succeeded in fixing anything and moving stuff. I saw at least one person from the Emek Shiloh list. Moshe Batish was there, too, and he's running for the Moetza council seat. Before previous moetza (regional council) elections, I had gone to a number of "meet the candidate" events, and I must say that Adler's was the best presentation I've ever experienced. Not only did he take notes as we spoke, he tried to answer some of our questions after all questions had been asked, including mine. Then when he rushed off to his next meeting of the evening, his crew (cabinet) stayed to further answer our questions. I was impressed that one even buttonholed me for more information. I have no doubt that we need new leadership in Mateh Binyamin. The only one offering that is Shiloh Adler. The icing on the cake is that he seems very competent and has surrounded himself with a good team.